We hope you are able to join us at The Atlantic Resort on Thursday evening, October 4th, 6-8pm. We look forward to connecting members of the Newport and Bristol County business communities to those running for office at this important event. Join us for complimentary hors d oeuvres and informative conversation at Atlantic Resort for this important election year event. 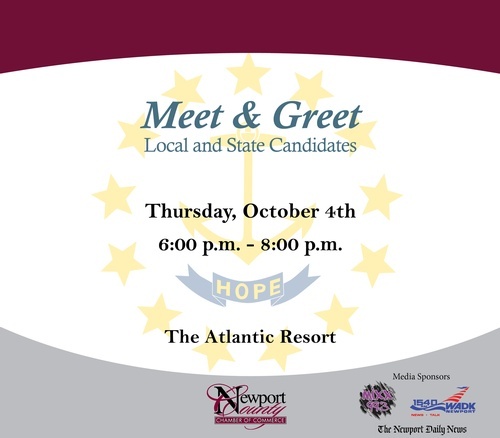 This free ‘Meet & Greet’ will give candidates the opportunity to meet with local community members and business leaders and exchange ideas on supporting the broader business environment in Newport County and throughout Rhode Island. It will also give our business leaders the opportunity to hear about candidates’ ideas and priorities.